Stunning and chic, this exquisite gold and diamond necklace by Van Cleef & Arpels contains all of the fine details and intricate design elements that make a luxury jewelry piece truly noteworthy. 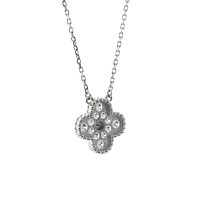 Suspended by a fine chain crafted in white gold, the floral motif pendant is set with round brilliant cut diamonds. Beaded edges add texture and draw the eye. Whether you're donning casual wear or a fine evening gown, you're sure to stand out in this incredible designer necklace.